Gaza City– The region is on edge as Israel retaliated for the capture of its spy dolphin off the Gaza coast by kidnapping Nachool the Hamas Bumblebee. Nachool, the host of a popular Gaza children’s show where he says some not-so-nice things about Jews, was snatched up late Wednesday evening and spirited away to an undisclosed location. While to date there has been no official statement from the Israeli government, the Daily Freier spoke to a Shin Bet agent known only as “Motti” for the inside scoop. 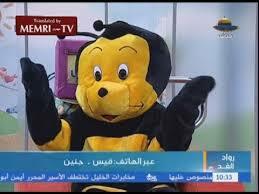 After the kidnapping, the streets of Gaza exploded in anger, as locals raged at perceived informants who betrayed their beloved Bumblebee. Incidentally, Gaza police arrested local television personality Farfour the Mouse on suspicion that he had a role in his rival’s kidnapping. International reaction to Israel’s action was swift, with Amnesty International, which described Nachool the Bumblebee as “a fruit merchant”, calling for a UN Security Council statement condemning Israel’s actions. United States Secretary of State Kerry, who was in the region to host a matkot tournament, told the Daily Freier that he was for Israel’s actions before he was against them. Jerusalem: Your friend Mike from back home is beginning to attract attention. As he sat next to you in a bar on Ben Yehuda Street in Jerusalem telling you just how awesome the city’s scene is, a nondescript man in his mid-50’s discreetly eavesdropped from a nearby table and gave the Daily Freier reporter a quiet play-by-play of unfolding events. “Just look at how he maintains eye contact with the subject while he tells him ‘Dude, you just don’t know what it’s like up here’” noted the nondescript man, identified only as ‘Motti’. Mike continued uttering complete BS to you as he explained “Jerusalem is actually BETTER, because it’s so underground. Do you know what I’m saying?” And no, you really don’t know what he’s saying.